What a hoot! 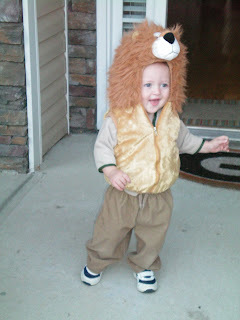 It was fun this year being able to dress a little one up in a costume. I originally wanted to dress Tyler up as John McCain and I would be Sarah Palin but we decided against that. 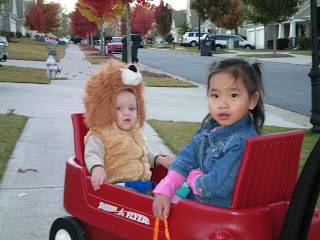 So, instead we went with the simple store bought lion costume. Tyler cracked us up. His head was much heavier which caused him to fall a little more often. Tyler seemed quite content in the wagon being pulled and actually acted like he might go to sleep! I bet he will be roaring next year. 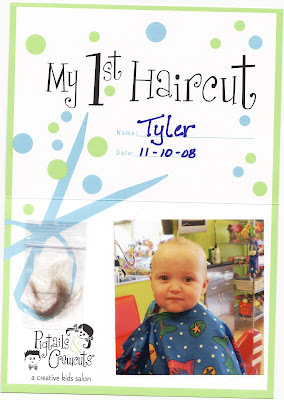 I realized this costume thing (at Tyler's age) was much more fun to all of us adults and we sure did get some laughs in! My sister, Beth, and her family came this weekend, which was a blast. BD loves Tyler so much and plays so well with him. Here are a few pictures from the weekend!